Stone & Wood’s Pacific Ale cold end up being the Australian beer scene’s version of Anchor Steam Ale – both in terms of the name becoming a style and also the need to fight off others who try and appropriate that name. Anchor Brewing in San Francisco had been making steam beer – brewed with lager yeast at ale temperature – for more than a century. After Fritz Maytag took over the ailing brewery in the 1970s, kicking off the craft beer movement in the United States, he had a few other people marketing steam beer in the US. He didn’t like that at all and apparently became quite litigious in stopping people using that name. Not even the official style guidelines were allowed to use it, having to create the name California Commons. In Australia, a similar situation may be brewing (by the way, saying something “is brewing” is the official way of referring to any ructions in beer scene). The ructions are over the Pacific Ale name – which is inextricably linked to the Stone & Wood brewery. Earlier this month noted trade-mark challenger Thunder Road (here’s what I wrote last time it happened, with a response from Thunder Road) launched a series of beers – one of them bearing the name “Pacific Ale”. The Thunder Road website claims “Pacific Ale” is “a relatively new beer style which has increased in popularity since 2001”. If you take umbrage at the idea that Pacific Ale is a style and not just the name of the beer, I thought that too – but Stone & Wood have referred to it as a style several times. One of those was on the very same Brews News article published about the Stone & Wood vs Thunder Road issue. That’s a bit unfortunate for Stone & Wood, and also creates a bit of wiggle room for Thunder Road. 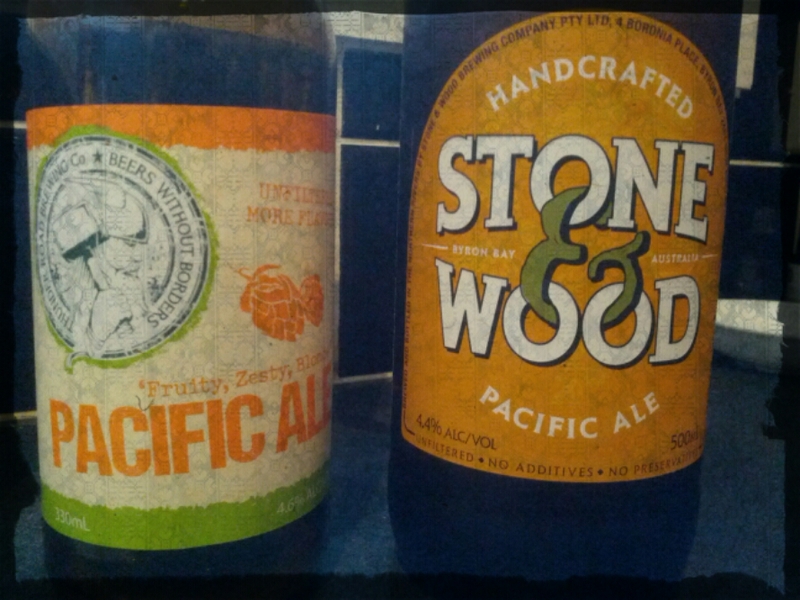 It would seem impossible for Stone & Wood to claim Pacific Ale isn’t a style when they’ve clearly said it is. And Thunder Road could say they’re treating that style name the same as they would “pale ale”, “hefeweizen” or any other style. But a la Anchor, Stone & Wood could say that as the originators of the style they have a right to the name. And, if the Pacific Ale name is trade-marked (which the Brews News story linked above says is true, at least to some degree) then they could argue that other breweries can make that style of beer but not use it in the name. Also, there would be the obvious need to protect the public image of their product, lest people conflate it with the Thunder Road version. But I don’t really think they’ll be quaking in their boots about my decision. Nor would they be too worried about what the beer geeks in general think because, while we may like to believe otherwise, we make up a very, very small percentage of beer drinkers. The market Thunder Road is aiming for isn’t the one who cares about the use of the name “Pacific Ale”. There is one thing I will leave you with – the Thunder Road Pacific Ale is actually brewed nowhere near the Pacific. It’s actually brewed in Belgium (a fact they clearly state on the label – which is more than some craft brewers do). Given the closest body of water to Belgium, maybe they could call it North Sea Ale instead. It’s as if Thunder Road are deliberately trying to antagonise. Even the label has a similar feel and colours. Any idea why the beer is brewed in Belgium? That’s odd. The IPA is brewed there too. Maybe the whole range is and the economies of scale worked.